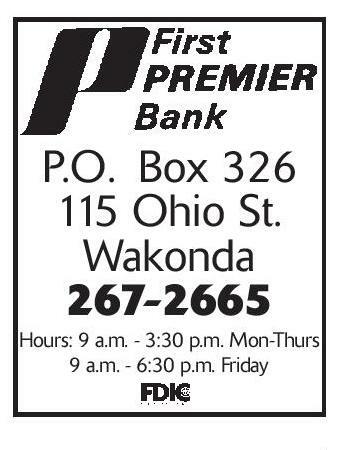 PAGE 8: SPRING SPORTS 2018 PRESS & DAKOTAN ? PLAIN TALK NEBRASKA GIRLS’ TRACK & FIELD SOUTH DAKOTA GIRLS’ GOLF Alcester-Hudson Parker COACH: Hillary McNamara VITALS: Region 3B LAST YEAR: The Cubs won the Region 3B title and ?nished eighth at the state tournament RETURNING: Calli Constance (Sr., 10th at state); Jordyn Huber (Sr.); Emily Ronning (Sr.); Abby Walth (Fr.) NEWCOMERS: Grace Pearson (8th) COACH: Tiffany Weiler ASSISTANT: Jaci Holzwarth VITALS: Region 3B RETURNING: Breanna Reynolds (Jr., state quali?er); Makenna Hertel (Jr.) Parkston Avon COACH: Tyler Hockett VITALS: Region 3A LAST YEAR: The Trojans ?nished ?fth at the state tournament RETURNING: Jayden Bormann (Sr., 9th at state); Jadee Mattheis (Sr., 33rd at state); Tylee Neugabauer (Jr., 45th at state); Ellie Weidenbach (So., 46th at state); Dani Norden (Jr., 67th at state); Hanna Jackson (So. ); April Will (Sr.); Keelie Konfrst (So. ); Kyla Konfrst (Sr.) NEWCOMERS: Faith Oakley (7th); Kayla Neugabauer (7th) Beresford COACH: Frank Cutler ASSISTANTS: Brooke Bonte VITALS: Region 4B RETURNING: Carly Sprik (Sr., state quali?er); Julia Cornell (Sr.); Abby Spawn (Jr.); Mariah Van Zee (So., state quali?er) Andes CentralDakota Christian Wausa’s Paige Nissen, front, was a state qualifier in the 100 and 200, and helped the Vikings to second in the 1600 relay at state a season ago. Bloom?eld COACH: Duane Wilken ASSISTANTS: Kirk Hamm, Lacey Thies, Jeff Fehringer, Brian Eisenhauer VITALS: Class D RETURNING: Brooklyn Eisenhauer (So. ); Brandi Guenther (Sr.); Michaela Johnson (Jr., state quali?er in pole vault); Hannah Schmeckpeper-Pena (Sr.); Bree Eisenhauer (So., 6th at state in 3200, state quali?er in 1600) Crofton COACH: Rod Hegge VITALS: Class C LAST YEAR: The Lady Warriors tied with Ainsworth for second in the Class C team race, behind Chase County RETURNING: Haley Arens (Sr., state champ in 3200, 2nd in 800 and 1600, ran on 3rd place 3200 relay); Lauren Arens (Sr.); Jessica Lange (Jr., state quali?er in pole vault); Josie Sanger (Jr.); Danielle Steffen (Jr.); Hannah Van Heek (Jr.); Alexis Arens (So., member of 3rd place 3200 relay); Taylor Arens (So. ); Ryan Ostermeyer (So. ); Taylor Schieffer (So. ); Keirra Vornhagen (So. ); Lauren Buschkamp (Fr. ); Kaley Einrem (Fr. ); Sarah Kleinschmit (Fr. ); Kelsey Schieffer (Fr. ); Lacey Sprakel (Fr. ); Abigail Steffen (Fr. ); Anastacia Suing (Fr. ); Brittany Tramp (Fr.) Laurel-Concord-Col. COACH: Shannon Benson ASSISTANTS: Carol Manganaro, Eric Depew, Zeke Stephens VITALS: Class C RETURNING: Sydney Chapman (throws); Jozie Schutte (sprints); Anna Casey (throws); Makayla Forsberg (sprints/jumps) NEWCOMERS: Erica Wolfgram (sprints/jumps); Kaylee Donner (distance); Glenda Vance (sprints) Niobrara-Verdigre CO-COACHES: Dana Konopasek, Emily Janak ASSISTANTS: Kelsey Mitteis, Jonathan Bos VITALS: Class C RETURNING: Genesis Saul (Sr.); Erika Kitto (Jr.); Emerson Randa (So.) NEWCOMERS: Megan Cook (Jr.); Ashlyn Hamilton (Jr.); Rachel Pavelka (So. ); McKenna Guenther (Fr. ); Emily Parks (Fr. ); Allie Kotrous (Fr. ); Kierra Moody (Fr. ); Winona Ware (Fr.) Ponca COACH: Jamie Hamar ASSISTANTS: Jessi Walsh, David Christensen VITALS: Class C RETURNING: Kelsey Fields (Sr.); Arens FROM PAGE 7 second in the 800 and 1600, and ran a leg on Crofton’s third-place 3200 relay. In all three of her individual events, Arens set a new Crofton record. She followed up that with a second-place finish at the state cross country meet last fall — another instance where she progressed throughout the season and finished with a flourish. “It’s not like I’m going to be breaking any records or anything at the beginning,” Arens said, with a smile. “It’s all about the course of the season and the progress that you make.” That doesn’t mean she doesn’t set specific goals for herself ahead of the season, though. At the state meet last year, Arens clocked personal bests in the 800 (2:18), 1600 (5:10) and 3200 (11:13.3), and she said she’d like to trim all of those times to within the next fastest minute. “They’re numbers things, but if I don’t hit those, I’m Kortney Fethkenher (Jr.); Kelsey Hamar (Jr.); Morgan Janssen (Jr.); Meg Keller (So. ); Morgan Nelson (So. ); Brooke Solomon (So. ); Maggie McGill (So. ); Kaci Day (So. ); Kai Seneveratni (So. ); Datilyn Chase (So.) NEWCOMERS: Kaitlyn Madsen (Sr.); Nicole Piccoli (Sr.); Dana Kratke (So. ); Gracie Voss (Fr. ); Alyssa Crosgrove (Fr. ); Hannah Wahls (Fr. ); Josie Reid (Fr. ); Eve Krusemark (Fr. ); Nayeli Cabrales (Fr. ); Brailie Brummond (Fr. ); Brooke Languis (Fr. ); Madison Riley (Fr.) Randolph COACH: Ted Stubbs ASSISTANTS: Tom Shafer, Mark Anderson VITALS: Class D RETURNING: Charlie Winkelbauer (Jr., state quali?er in 3200 relay); Addison Villwok (Jr., state quali?er in 3200 relay); Emma Bermel (Jr., state quali?er in 3200 relay); Bobbi Winkelbauer (So., state quali?er in 3200 relay); Jordan Mavis (So.) NEWCOMERS: Arianne Greiner (Fr. ); Natalie Munter (Fr. ); Kellie Pinkelman (Fr. ); Baylie Shearer (Fr.) COACH: Tom Cooney ASSISTANT: Jeremy Boer VITALS: Region 4B RETURNING: Emily Iverson (Jr.) COACH: Jeff Haen?er ASSISTANT: Jody Gittings VITALS: Region 4B RETURNING: Karli Johnson (Sr.) NEWCOMERS: Madisyn Cameron (So. ), Maddie Kocmich (Fr. ), McKenna Kocmich (6th) COACH: Brad Muller VITALS: Region 2A RETURNING: Kadison Satter (Jr.) NEWCOMER: Maiya Muller (7th) Bon Homme COACH: Zach Wevik ASSISTANT: Matt Aarstad VITALS: Region 4B RETURNING: MaKayla Kelly (Fr. ), Zoe Libis (7th), Emma Pruss (7th) NEWCOMER: Bailey Kortan (Sr.) Centerville COACH: Davee Kilian VITALS: Region 3B RETURNING: Ally Johnson (Sr., 26th at state); Kaitlynn Skotvold (Sr.); Amanda Knutson (Jr.) Wausa COACH: Greg Conn ASSISTANTS: Kristen Frevert, Julia Mohr VITALS: Class D RETURNING: Thea McFarland (Sr., state quali?er in 100 hurdles and 300 hurdles, member of 2nd place 1600 relay); Paige Nissen (Jr., state quali?er in 100 and 200; member of 2nd place 1600 relay); Ruth Johnson (Jr., state quali?er in long jump; member of 2nd place 1600 relay); Siera Brazel (Jr.); Destiny Fox (Jr.); McKayla Hoppe (So. ); Kaitlyn Kumm (So. ); Ainsley Nelson (So. ); Esther Nelson (So. ); Shelby Timmerman (So. ); Melanie Vanness (So. ); Anne Wookman (So. ); Hannah Hubers (So.) NEWCOMERS: Jaide Kaiser (Fr. ); Morgan Kleinschmit (Fr. ); Brooke Kumm (Fr. ); Charlie Price (Fr.) Wynot COACH: Lee Heimes ASSISTANT: Tammy Wieseler VITALS: Class D RETURNING: Julie Eskens (Sr.); Emma Folkers (Sr.); Grace Driver (Jr.); Katelyn Heine (So. ); Michaela Lange (So. ); Noelle Wieseler (So. ); Shaelee Planer (So. ); Kaitlyn Heimes (So.) NEWCOMERS: Teresa Alvarez (Sr.); Autumn Lawson (Fr. ); Reanna Greninger (Fr. ); Autumn Guenther (Fr. ): Ruth Dodge (Fr. ); April Folkers (Fr. ); Edyn Sudbeck (Fr. ); Emersyn Sudbeck (Fr.) not going to be like, ‘Oh, I’m devastated,’” Arens said. “It’s that little something more to push for. “It’s one of those things where I know I can do, it’s just matter of how soon is it going to happen.” As Arens progresses throughout the track season this spring, another motivation will be waiting for her at the state meet. Ainsworth standout Rylee Rice, now a sophomore, won four individual titles a year ago and beat Arens in the 800 and 1600. The two then locked horns at the state cross country meet last fall, where Rice beat Arens in the Class D race — they were 1-2, respectively. Arens said she embraces the challenge of running with Platte-Geddes Parkston senior Jayden Bormann was ninth in Class A a season ago. Elk Point-Jefferson COACH: Kelly Haberling VITALS: Region 2A RETURNING: Aubrie Franken (Jr.); Hannah VanKirk (Jr., state quali?er); Sydney Bousquet (So., state quali?er); Emily Henze (So. ); Sophie Johnson (Fr. ); Elise King (8th); Addison Butler (8th); Bailey Bergult (8th) NEWCOMERS: Lizzy Connelly (8th); Taryn Rupp (8th); Augistine Stokely (8th) Freeman COACH: Kristina Sage VITALS: Region 3B Track & Field Bob Prince Indoor (Vermillion) Dan Lennon Inv. Lounsbery Early Bird ccd. Burnell Glanzer Inv. (Armour) 2 p.m. Rotary Relays (Centerville) 1 p.m. Tri-State Inv. (Gayville) 1 p.m. Great Plains Conf. (Burke) 11 a.m. First Dakota Relays 2 p.m. 5/1 5/4-5 5/8 Don Diede Relays (Freeman) 1 p.m. Howard Wood Dakota Relays Tri-Valley Conf. (Gayville) 1 p.m. (at Yankton) Freeman AcademyMarion COACH: Jesse Johnson VITALS: Region 3B RETURNING: Amy Ptak (Sr.) Irene-Wakonda COACH: Heath Marshall VITALS: Region 3B RETURNING: Baylee Boese (So. ), Bella Erickson (Fr. ), Dora Johnke (Fr.) 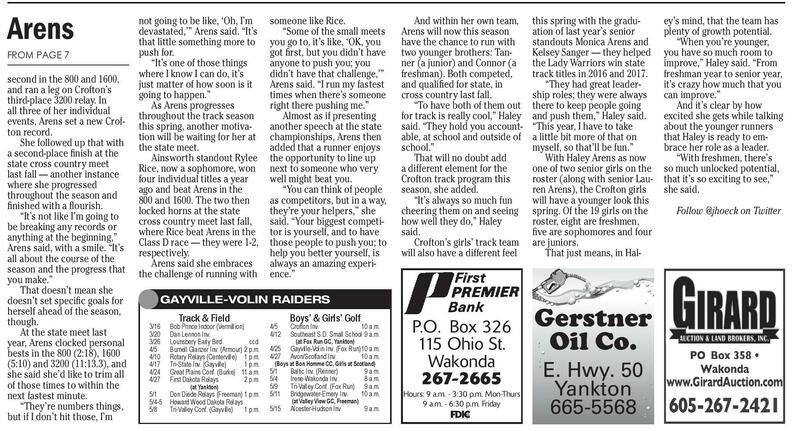 Viborg-Hurley COACH: Tony Hauger VITALS: Region 3B NEWCOMER: Kate Hauck (7th) Wagner COACH: Riley Kirwan VITALS: Region 3A RETURNING: Emilea Cimpl (So. 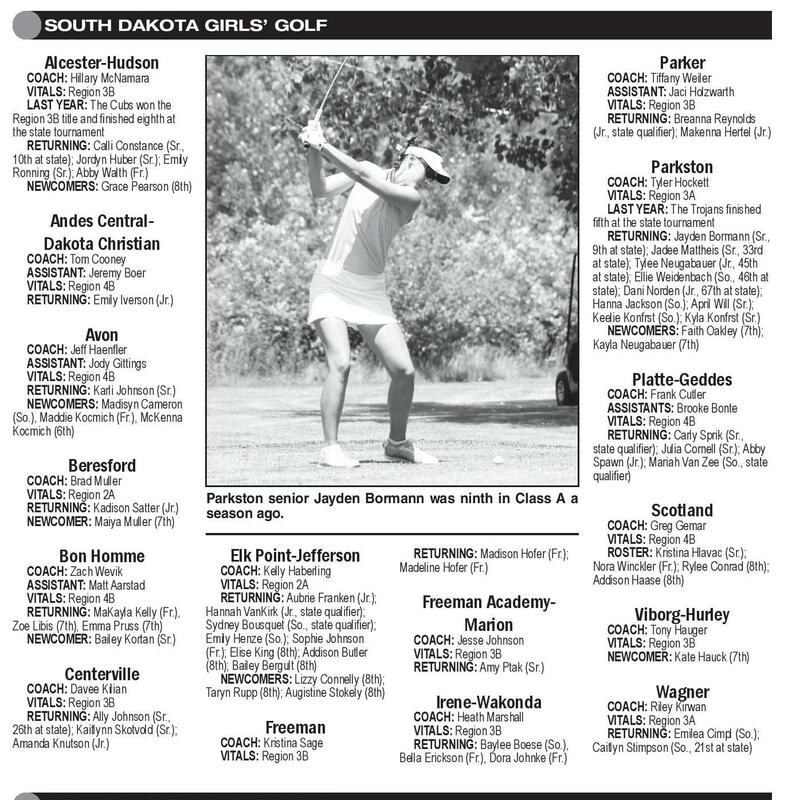 ); Caitlyn Stimpson (So., 21st at state) SOUTH DAKOTA BOYS’ GOLF Alcester-Hudson COACH: Steve Hale VITALS: Region 3B RETURNING: Josh Grif?th (Sr.); Izaak Reed (So. ); Ayden Moerman (Fr. ); Trevor Peterson (So. ); Ryan Sogn (Fr. ); Tristan Van Wyk (Fr. ); Wyatt Boisvert (8th) NEWCOMERS: Cyrus Rasmussen (8th); Caden Winquist (7th); Carter Klassen (7th); Ayden Stocking (7th); Kaiden Haider (7th) Andes CentralDakota Christian COACH: Tom Cooney ASSISTANT: Jeremy Boer VITALS: Region 4B RETURNING: Micah Mitchell (Jr.); Jacob Maynard (Jr.) Avon COACH: Jeff Haen?er ASSISTANT: Jody Gittings VITALS: Region 4B RETURNING: Landon Pudwill (So. ), Jared Mudder (So. ), Trent Raysby (So.) NEWCOMER: Tanner Kotalik (6th) VITALS: Region 4B LAST YEAR: State champion Alec Johnson graduated RETURNING: Beau Rothschadl (Jr.), Cole Bares (So. ), Hunter Lindula (So. ), Carter Libis (So. ), Gavin Martin (Fr.) NEWCOMERS: Tyler Kopp (Jr.), Christian Uecker (Jr.) Centerville COACH: Davee Kilian VITALS: Region 3B RETURNING: Seth Hill (8th) NEWCOMERS: Lee Wesche (Sr.); Isaac Hill (So.) Bon Homme COACH: Zach Wevik ASSISTANT: Matt Aarstad someone like Rice. “Some of the small meets you go to, it’s like, ‘OK, you got first, but you didn’t have anyone to push you; you didn’t have that challenge,’” Arens said. “I run my fastest times when there’s someone right there pushing me.” Almost as if presenting another speech at the state championships, Arens then added that a runner enjoys the opportunity to line up next to someone who very well might beat you. “You can think of people as competitors, but in a way, they’re your helpers,” she said. “Your biggest competitor is yourself, and to have those people to push you; to help you better yourself, is always an amazing experience.” 4/5 4/12 And within her own team, Arens will now this season have the chance to run with two younger brothers: Tanner (a junior) and Connor (a freshman). Both competed, and qualified for state, in cross country last fall. “To have both of them out for track is really cool,” Haley said. “They hold you accountable, at school and outside of school.” That will no doubt add a different element for the Crofton track program this season, she added. “It’s always so much fun cheering them on and seeing how well they do,” Haley said. Crofton’s girls’ track team will also have a different feel Boys’ & Girls’ Golf P.O. Box 326 115 Ohio St. Wakonda 267-2665 Crofton Inv. 10 a.m. Southeast S.D. 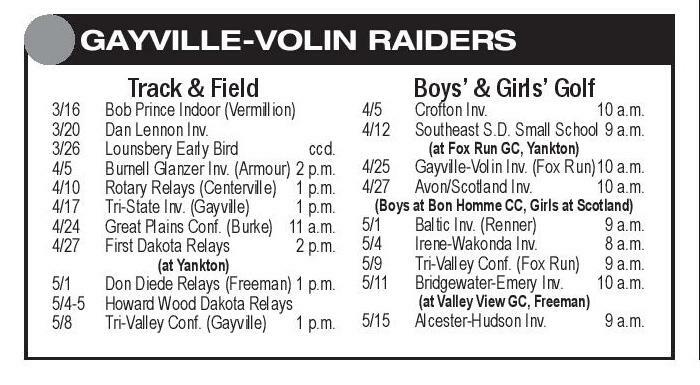 Small School 9 a.m. (at Fox Run GC, Yankton) 4/25 4/27 Gayville-Volin Inv. (Fox Run) 10 a.m. Avon/Scotland Inv. 10 a.m. 5/1 5/4 5/9 5/11 Baltic Inv. 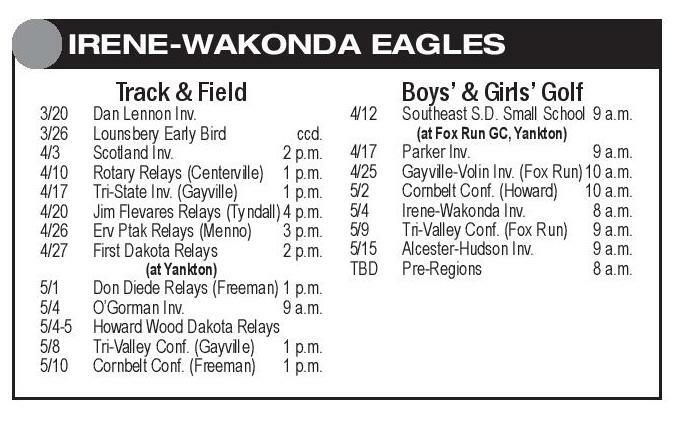 (Renner) 9 a.m. Irene-Wakonda Inv. 8 a.m. Tri-Valley Conf. (Fox Run) 9 a.m. Bridgewater-Emery Inv. 10 a.m. 5/15 Alcester-Hudson Inv. (Boys at Bon Homme CC, Girls at Scotland) (at Valley View GC, Freeman) 9 a.m. Freeman AcademyMarion COACH: Jesse Johnson VITALS: Region 3B NEWCOMERS: Phillip Balzer (So. ), Angel Hernandez (Fr. ), Noah Hofer (8th) Irene-Wakonda COACH: Heath Marshall VITALS: Region 3B RETURNING: Kaden Mork (Sr., state quali?er); Cole Norris (Sr.); Bentley Book (Jr.); Dawson Johnke (8th) NEWCOMERS: Matthew Roth (Sr.); Korie Norris (Fr. ); Elyjah Kleinschimt (7th) Freeman COACH: Kristina Sage VITALS: Region 3B LAST YEAR: The Cornbelt Conference runner-up, the Flyers return two golfers who quali?ed for state RETURNING: Brayden Edwards (Sr.); Eric Fuhrmann (Sr.); Bailey Sage (So., tied for 24th at state); Tryg Aanenson (So., tied for 51st at state) NEWCOMER: Dausyn Pravecek (Jr.) GAYVILLE-VOLIN RAIDERS 3/16 3/20 3/26 4/5 4/10 4/17 4/24 4/27 RETURNING: Madison Hofer (Fr. ); Madeline Hofer (Fr.) Scotland COACH: Greg Gemar VITALS: Region 4B ROSTER: Kristina Hlavac (Sr.); Nora Winckler (Fr. ); Rylee Conrad (8th); Addison Haase (8th) Hours: 9 a.m. - 3:30 p.m. Mon-Thurs 9 a.m. - 6:30 p.m. Friday Parker COACH: Tiffany Weiler ASSISTANT: Jaci Holzwarth VITALS: Region 3B LAST YEAR: The Pheasants won the region title and ?nished ninth at the state tournament RETURNING: Trey Christensen (Jr., 9th at state); Alex Kasten (Jr., state quali?er); Sam Gillespie (Jr.); Noah Maska (Jr., state quali?er); Nick Haraldson (Jr.); Jackson Fiegen (Jr.); Jaron Pesicka (Jr., 24th at state) NEWCOMERS: Alex Nelson (Jr.), Geoff Dunkelberger (Fr. ), Dylan Chester (Fr.) this spring with the graduation of last year’s senior standouts Monica Arens and Kelsey Sanger — they helped the Lady Warriors win state track titles in 2016 and 2017. “They had great leadership roles; they were always there to keep people going and push them,” Haley said. “This year, I have to take a little bit more of that on myself, so that’ll be fun.” With Haley Arens as now one of two senior girls on the roster (along with senior Lauren Arens), the Crofton girls will have a younger look this spring. Of the 19 girls on the roster, eight are freshmen, five are sophomores and four are juniors. That just means, in Hal- Platte-Geddes COACH: Frank Cutler ASSISTANT: Brooke Bonte VITALS: Region 4B LAST YEAR: The Black Panthers won the region title and ?nished in a tie for fourth at state RETURNING: Payton Foxley (Sr., state quali?er); Stewart Van Zee (Jr., state quali?er); Brody Boltjes (Fr., 9th at state) NEWCOMERS: Hayden Koopal (Jr.); Peyton Nelson (Sr.) Scotland COACH: Greg Gemar VITALS: Region 4B ROSTER: Grayden Furney (Sr.); Triston Friederich (Jr.); Dane James (Jr.); Derek Pravecek (So. 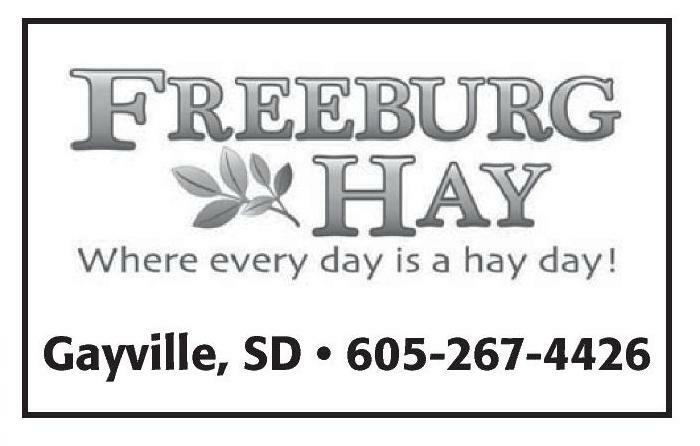 ); Ethan DeBoer (8th); Conner Odens (8th) Viborg-Hurley COACH: Tony Hauger VITALS: Region 3B RETURNING: Nick Sorlien (Sr.), Lucas Nielsen (Sr.), Josh Green (Jr.) NEWCOMERS: Klayton Paetow (8th), Ryder Christensen (7th) ey’s mind, that the team has plenty of growth potential. “When you’re younger, you have so much room to improve,” Haley said. “From freshman year to senior year, it’s crazy how much that you can improve.” And it’s clear by how excited she gets while talking about the younger runners that Haley is ready to embrace her role as a leader. “With freshmen, there’s so much unlocked potential, that it’s so exciting to see,” she said. 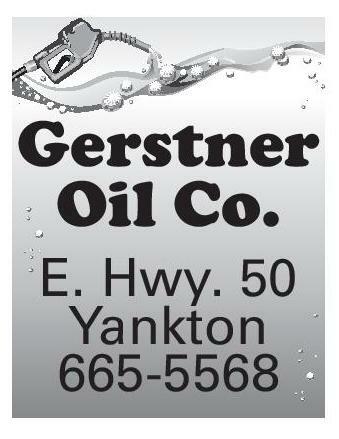 Follow @jhoeck on Twitter Gerstner Oil Co. E. Hwy. 50 Yankton 665-5568 This is the story... That covered an event ... That your child was featured in... That created a lasting memory! 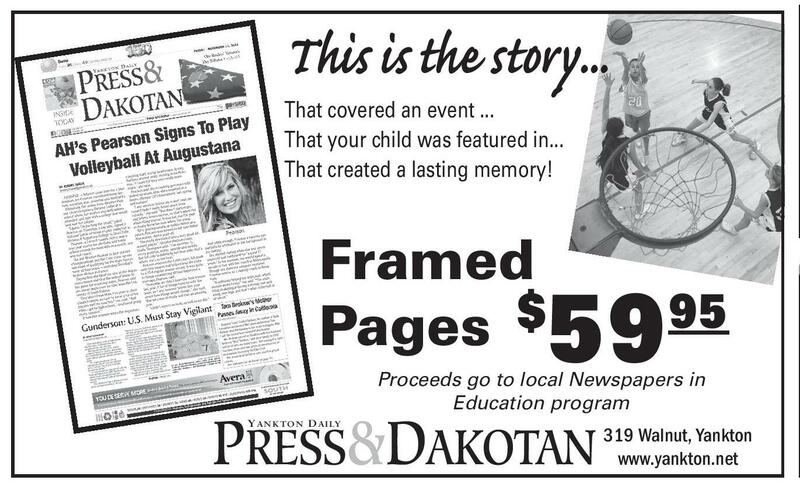 Gayville, SD • 605-267-4426 Framed Pages $ 59 IRENE-WAKONDA EAGLES 95 Proceeds go to local Newspapers in Education program PRESS&DAKOTAN Y A N K T O N D A I LY 319 Walnut, Yankton www.yankton.net Track & Field 3/20 3/26 4/3 4/10 4/17 4/20 4/26 4/27 Dan Lennon Inv. Lounsbery Early Bird ccd. Scotland Inv. 2 p.m. Rotary Relays (Centerville) 1 p.m. Tri-State Inv. (Gayville) 1 p.m. Jim Flevares Relays (Tyndall) 4 p.m. Erv Ptak Relays (Menno) 3 p.m. First Dakota Relays 2 p.m. 5/1 5/4 5/4-5 5/8 5/10 Don Diede Relays (Freeman) 1 p.m. O’Gorman Inv. 9 a.m. Howard Wood Dakota Relays Tri-Valley Conf. (Gayville) 1 p.m. Cornbelt Conf. 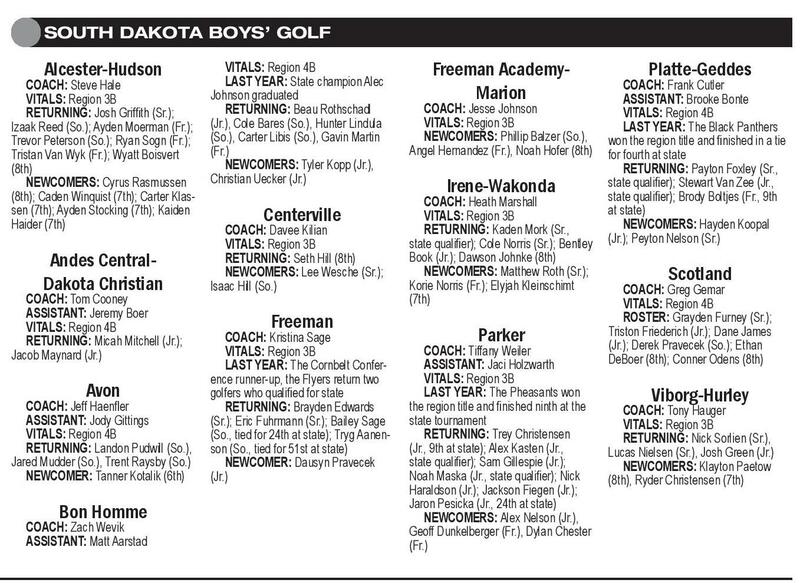 (Freeman) 1 p.m. (at Yankton) 4/12 4/17 4/25 5/2 5/4 5/9 5/15 TBD Boys’ & Girls’ Golf Southeast S.D. Small School 9 a.m. (at Fox Run GC, Yankton) Parker Inv. 9 a.m. Gayville-Volin Inv. (Fox Run) 10 a.m. Cornbelt Conf. 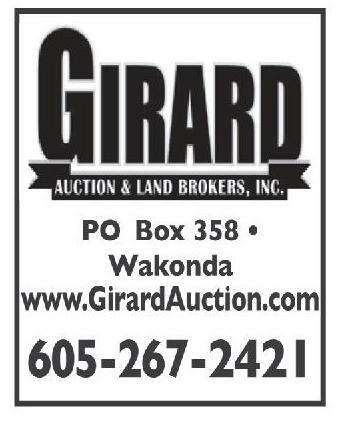 (Howard) 10 a.m. Irene-Wakonda Inv. 8 a.m. Tri-Valley Conf. (Fox Run) 9 a.m. Alcester-Hudson Inv. 9 a.m. Pre-Regions 8 a.m.